Preheat oven to 350 degrees. While heating, fill a cake pan halfway with hot water and place on bottom oven rack. In a large bowl, mix together all the crust ingredients and press into the bottom of a spring-form pan, set aside. Scrape the inside of the vanilla beans out with a sharp knife. Place scrapings on a small glass plate, set aside. Using an electric mixer, mix the cream cheese, stevia and vanilla beans until well blended. With the mixer on low, add the eggs to the cream cheese mixture one at a time until well blended. Place cheesecake on middle oven rack, directly above the pan filled with hot water (NOTE: doing this prevents the top of the cheesecake from cracking during the baking process). Bake for 1 hour to 1 hour 15 minutes (ovens vary) until the center is set and the top is lightly browned. Allow cheesecake to COMPLETELY cool before removing the spring form pan (overnight is best). 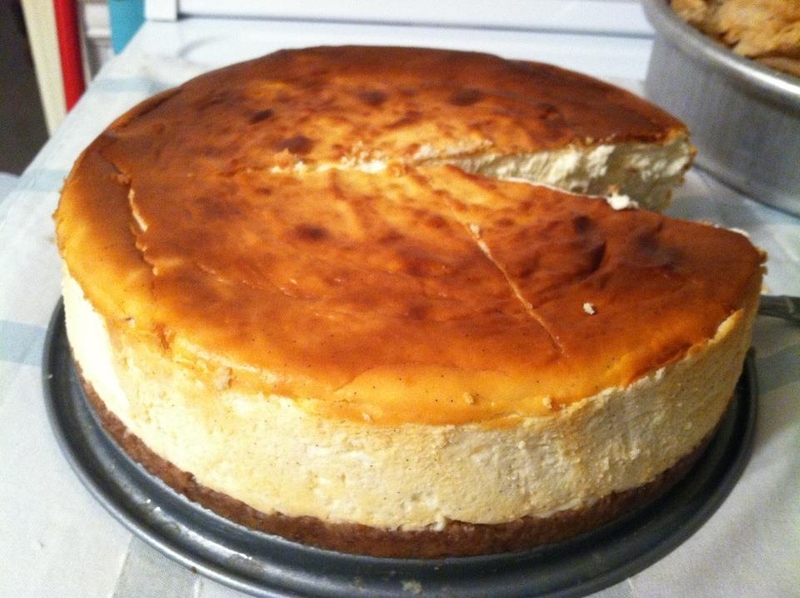 Once cooled, take a knife and run it around the edge of the spring form pan to help release and loosen the cheesecake.